It’s not exactly fun to think about, but it’s important for every woman to consider what would happen if she was unable to direct her medical care. If (heaven forbid) you had an accident that prevented you from voicing your decisions, it would fall to your loved ones to decide on your medical treatment. As the legal and emotional battle within Terry Schiavo’s family demonstrated, the process could carry a high emotional and financial toll if family members are unable to agree. 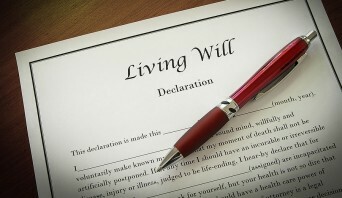 In a 2010 study in the New England Journal of Medicine, more than half of the subjects did not have living wills, and it was difficult for their family members and doctors to determine their preferences for medical treatment. While it’s not super pleasant, it’s important to take the time to think about your preferences now, to ensure that your decisions will be carried out later. LearnVest is the leading personal finance site for women. Our free Money Center will help you create a budget. Our free bootcamps will help you take control of your money, cut your costs or get out of debt. And our premium financial plans–managed by LearnVest Certified Financial Planners–can help you chart a course for the future you want. Posted October 29th, 2012 & filed under Health, Money.